These are the most common microphones you’ll find in any recording studio you walk into. In many cases you’ll find multiple condenser mics in recording studios (mostly for different recording applications). Condenser mics have a really good frequency response and have the ability to reproduce sound accurately in it’s most purist form. Condenser mics can be pretty expensive depending on what brand you shop for but, thanks to the advancements in technology there is now a good mic in every price range. Now in order to use these mics you’ll need an additional piece of equipment known as phantom power. Phantom power is basically a power supply used to power your microphone (fair enough). Some condenser mics come with phantom power boxes but if yours doesn’t don’t worry as phantom power also comes pre built in with your mixer, mic preamp or audio interface. Large condenser’s are popular because they are good for vocals and any instrument where low tones are present. Another great thing about large condenser mics is they add a little warmth to the recordings. Make sure you use a good pop filter when recording vocals because this mic very sensitive to transients sounds (sometimes called plosives) such P’s and B’s or any type of sound that puffs air forward. Without the pop filter you will have horrible sounding recording sessions. These mics have a fast transient response (ability to reproduce little sounds) and are great for picking up details in recordings. In vocal recordings this mic will pick up everything from lip smacking of your lips to your tongue hitting the roof of your mouth and your teeth during a recording. With stringed instruments it’ll pick up great finger slides, accidental finger slides, light deck hits and other natural random sounds. One down side to small condenser mics is it’s sensitivity to loud sounds. To loud of a sound feed into condenser can ruin it. Dynamic mics are built like tanks compared to the condensers. You can throw them, drop them, throw them into traffic and they’d still work. The most popular dynamic mics are Shure’s SM58 and SM57 models and any band who’s who’s touring has at least 5-6 of these bad boys with them at all times. They are excellent all around mics for both studio and live stage performances and shine when it comes to recording vocals as well as instruments. The best thing about dynamic mic is it doesn’t require any additional powering (unlike the condenser mic). Dynamic microphones do have a more limited frequency response compared to the condensers making them less likely to be overloaded by loud sound and lastly they are not as accurate when it comes to sound reproduction. Keep in mind there are some dynamic mics that are better than others I was always like to go down to my local music store and try them out. They wont allow you to test a mic out of the box but the mics on display are another story. Dynamic Or Condenser… Which One To Choose? 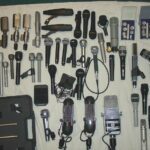 So now the big question is “which is the best microphone to choose for my recording studio?” In order to figure this out you’re going to have to take what type of recording you’ll be doing into consideration. So with that said let us round up some of the facts to make it a much easier decision. Recording Vocals – For vocal recording projects you’re going to want to use a large diaphragm condenser mic but remember they need phantom power. If you’d like an alternative that doesn’t require phantom power then consider going with a dynamic microphone or a USB condenser mic. Recording String Instruments – As I’ve mentioned above small diaphragm condenser microphones shine because they able to pick up a lot of detail from the source. You’ll want to make sure you go with a trusted brand when shopping for you main recording mic. Recording Live Bass – This is a job for a large condenser mic because of it’s slower response time as well as it’s low frequency reproduction which in turn gives warmth to recordings. Recording Drum Sets – this can be done with 1-2 mics (a lot people will argue against this) but for best results you’ll want to use an assortment of dynamic and condenser mics. I would suggest using dynamic mics for the kick drums since they can withstand louder sounds, small condenser mics for the overheads and maybe something like an SM57 for recording the snares. I’m sorry I didn’t see this reply until Rich commented. There are a few good ones out there and better ones being built every few months. Audio Technicas (AT2020) and the MXL line. I would point you in the direction of the AT2020, but you will need a very quiet room to use it. If you’re on a budget I’d go with a cheap audiobox (presonus) and an AT2020 XLR condenser mic. It’s cheap, it’s quality. Not many mics fall into that category. This is a great guide to microphones, especially on the differences between the large and small diaphragm sizes. Great post. Julio – if you want to get decent vocal recording results, I’d avoid the USB mics. You would be much better off investing in an audio interface and a condenser XLR mic. I owm a rode m2 live condenser. I just want to know a fact that the response mentioned is 35 hz to 20 kHz. I am a baritone . I have heard that no one can sing or speak in the 20 hz or 50 hz range. If this is a fact then why this mic cannot respond to lower frequencies that efficiently like an ldc. If i use this as a side adress mic will it improve a bit. Overall its a great for live but in my small studio ( homehome setup) i use saffire 6 usb ad a mic pre and altec lensing multimedia speakers. My studio setup is not proper. I just close window s and record. i dont have airconditioning also. I want to know whether changing position of mic or source will help or should i change to ldc. Just want to clear few doubts. If the specs say 20hz to 20 kHz and if the diaphragm is small will it be proper for a baritone singer or is it a fact that baritone singers should preferably use ldc’s only. If specs say 3 Polar patterns then is it so that the lower frequency response is best only in the Omni mode and if used in cardiod mode it ll give only clear sound. If the xlr mic cable is twisted while recording and the soldering is out is it possible that it will damage the capsule or fet. If you can clear these doubts i will be able to decide about buying a condenser mic.